Today the Pit Bull is either loved and cherished by those who know her or vilified and demeaned by those who fear her. The Nanny Dog has gone from baby sitter to child killer. From child protector to fiendish fighter. The truth lies somewhere between these two extremes and the fault does not lie with the dog. Oddly, the dog itself has not changed, but our perceptions certainly have. The American Pit Bull Terrier (APBT) has its roots in England and Ireland where it was bred from a variety of Bull Dog and Terrier breeds. The Pit Bull (also known as the Staffordshire Terrier here in the U.S. [see note at bottom]) was originally brought to the U.S. during the Irish potato famine of the mid seventeen hundreds. Irish and Scot-Irish loved their dogs and introduced them here. Today's Pit Bull is a solid, medium-sized, short (single coat) haired dog. It is a member of the molosser breed group. Molossers were it was (and still is) a shepherding breed from the area between Greece and Albania. Over time the people of the British Isles crossed this breed with bull dogs and terriers. Eventually the dog was used for bull-baiting. Bull baiting involves tying a bull to a stake and giving the bull about thirty feet of radius in which to move. Dogs are then released upon the bull. The intention is for the dogs to immobilize the bull by biting and firmly holding the bull's snout until it stops moving. In fact this was the original purpose of the appropriately named bull dog. The bull was then "dispatched" and the town butcher parceled out the bull; the best cuts going to the winning dog's owner. At the time there were actually laws specifying that any bull meat sold had to be "baited" first. The thought was the meat would taste better if the bull was stressed before the kill. Eventually the practice fell out of favor, not because of any cruelty issue, but because the noise of the fights were a nuisance to the rapidly expanding population. Parliament passed a law forbidding the baiting of bulls in 1835. The American Staffordshire Terrier and The American Pit Bull Terrier (APBT) by breed are from the same lineage; "Staffordshire" was the name given by American Kennel Club, and American Pitt Bull Terriers by United Kennel Club. The breeds are different despite the seemingly interchangeable name. The American Pit Bull Terrier tends to be about six inches taller and about thirty pounds heavier than the Staffordshire. Beyond that they appear to be the same dog. With the outlawing of bull-baiting and other blood sports, owners bringing the breed to America tended to keep their dogs due to loyalty, bravery, and love of the human family. Over time the dog became so popular that it came to be viewed as "The American Dog." It was prominently featured in war bond posters (see image left). RCA Records and Buster Brown Shoes both used the breed as mascot. 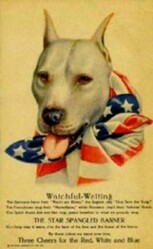 A Pit Bull named Stubby was a decorated World War I hero. Helen Keller and Teddy Roosevelt both owned the breed. Later. in the early twentieth century, Hal Roach Studios featured a Pit Bull named "Petey" in the "Our Gang" series. Petey typically playing with the children, rescued them or their possessions from villains and performed other brave acts of loyalty to his human "Our Gang" family. RCA Logo "His Master's Voice"
Petey with "Our Gang" in "The Pooch"
This dog is loyal, energetic, and courageous. They are also playful and intelligent. They should be socialized to other animals and people (adults and children) as puppies. As with most dogs the American Pit Bull should be trained early to recognize humans as alpha leader. This can be accomplished by establishing rules and boundaries for the dog. This usually involves teaching the dog "No" and the meaning of that word early on. Regular brushing with a bristle brush or a rubdown with chamois skin will help keep the coat shiny and clean. Baths are only required when necessary. This dog needs vigorous exercise. A home with a yard or frequent trips to a dog park is the ideal. It is also a good idea to encourage curiosity in the dog with "environmental enrichment" such as toys, new scenery and situations, as well as meeting new people and other animals. This dog has few health problems. But the most common are heart murmur and mange. Dermatitis mange can be caused by a mite infestation or possibly just be an allergic reaction. If the mange is caused by mites the dog can be treated with a weekly dusting of florets of sulfur. Only a veterinarian can determine if the dog has heart murmur and she can recommend a course of action if this condition is found. American Pit Bull Terriers typically lives twelve to fifteen years. Originally the American Pit Bull was classified as a working dog. Over time this changed more to a companion animal, but lately the tide is turning back to that of working dog. American Pit Bulls are now often employed as service dogs, police & armed services dogs, search and rescuers, and therapy animals. They also find work as livestock workers. The American Pit Bull can also be trained to compete in a wide variety of organized dog sports. This includes herding, competitive Frisbee as well as conformation to verbal commands. They make excellent loving pets for children and seniors, and everyone in between. They are one of the most versatile dog breeds on the planet. A great deal of this agility in function can be traced directly back to its beginnings as a baiting or fighting dog. Certain towns and counties in Colorado have outright bans on the American Pit Bull. These include Aurora, Castle Rock, Commerce City, Denver, Fort Lupton, Lone Tree, Louisville, and Rifle. Almost every state in the United States has a share of cities or counties with some form of restriction on the American Pit Bull. Some localities have laws which classify the dog as "vicious" or "dangerous" thereby allowing officials to deal with the dog in specific ways. Others have outright bans on ownership. Often these laws allow city or county officials to fine owners and destroy dogs. Australia, New Zealand, Ecuador, Canada, Malaysia, Puerto Rico, Singapore, and Venezuela all have enacted some form of breed-specific legislation on "pit bull-type dogs", This includes American Pit Bull Terriers. These laws range from outright bans to restrictions and conditions on legal ownership. The state of New South Wales in Australia places restrictions on the breed, including mandatory sterilization. Is it a Staffordshire or an American Pit Bull? The United Kennel Club (UKC) was originally formed exclusively to register the American Pit Bull. They also gave advice on how to fight the dog. The American Kennel Club, after being petitioned to accept the dog, only did so starting in 1936. As a condition of registration the dog owner had to refer to the animal as "Staffordshire Terrier" rather than "American Pit Bull;" this to distance the club from dog fighting. Petey, the dog that starred in the "Our Gang" series was actually registered with both clubs as an American Pit Bull and as a Staffordshire Terrier. He was one of the first dogs so registered. Eventually the UKC started registering other working dogs and eventually banning registrants convicted of dog fighting. In effect the UKC completely reversed its previous policies. To this day the UKC and AKC recognize the same dog, but under different names. Though this dog has a checkered past, it, like any other breed considers its human companion a member of its family and acts accordingly. It is time to revisit Breed Specific Legislation for all breeds. it is obvious to me, at least, that these laws have little to do with reality and almost everything to do with unreasoned fear based solely on the look of the dog. Thanks georgette. I think one of my "dog" articles will be the how to establish alpha status or the basics of training. They are a very beautiful, devoted breed of dogs. My brother has one and so do my parents but as with any dog, they have to be trained well and brought up with plenty of attention within the family. Great Article! Aw thanks Kat. I'm thinking about my next piece. I'm thinking of calling it "For the Love of Dog." BTW our new pit bull puppy ( now 5 months old) is best friends with our cat, other dog and everyone she meets.